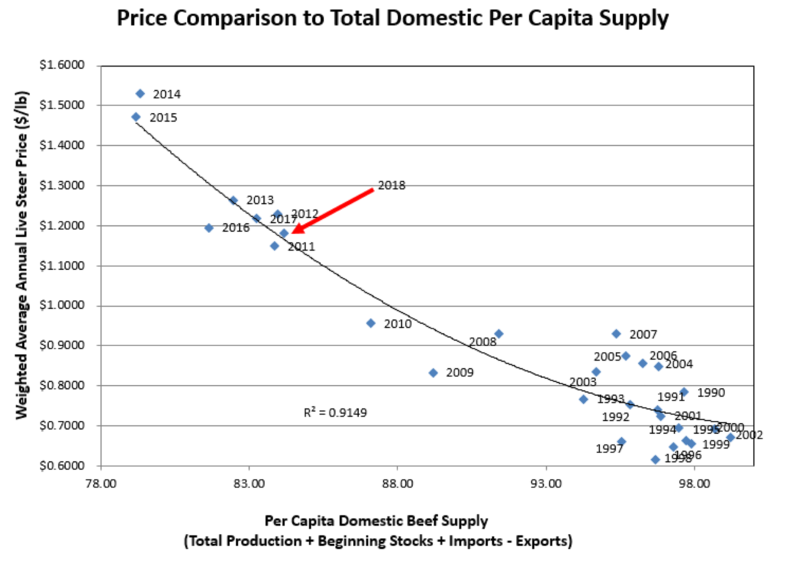 Does increased beef demand result in better cattle prices? You better believe it. I got a call recently from a reader who had several concerns. Space doesn’t allow me to address all of them, but let’s look at a couple. He wondered why good beef demand both here and abroad hasn’t translated into better prices at the ranch level. On the other hand, I’ve been amazed that prices have stayed robust this year. So I did some checking and found some interesting numbers. Without this demand increase, realized prices would have been $112.57 for fed cattle and $146.02 for feeders—that translates to a $5.43 per cwt increase for fed cattle and a $10.98 increase for feeders. These impacts are just from domestic demand. Throughout the year, we’ve reported that increased export demand has been a key factor underpinning cattle prices. Does increased beef demand result in better cattle prices? You better believe it. Another concern he had is the tremendous margin that packers are enjoying. Indeed, packers have been exceptionally profitable of late. Is that a bad thing? A simple explanation is that supply and demand work. Beef production, a direct result of more cattle numbers, is up—6.4% in 2016, 3.8% in 2017, 4.7% in 2018 and a projected 1.8% in 2019. Now consider that during the time when COOL was in effect, six beef packing plants closed because of the resulting increased cost and loss of efficiency. Also consider that when COOL was in effect, our cattle numbers were at historic lows, so COOL wasn’t the only factor in those plants shutting down. But the extra burden that COOL imposed was clearly a factor. We have a situation now where we have more cattle to process and fewer packing plants to do so. That puts cattle feeders in a position of competing for chain space. The graph above shows this price-supply relationship. Two plants have been built in the West—a plant in Aberdeen, S.D. and another in Boise, Idaho. Those will help even out the supply choke-point that packers enjoy, but not enough to balance the equation. So packers will continue to enjoy good profitability, as long as beef demand remains strong and retailers pay up for the product. Another truism is that the cattle cycle is in effect. So, in a few years, the supply situation will change and there will be fewer cattle available for packers to process. Plus, packers making a profit is a good thing. If they don’t, more plants will close. That’s bad for beef producers. Consumers don’t buy your cattle—they have to be processed into consumer-ready beef. Bottom line: COOL was and is bad for the beef business. Consumer demand both here and abroad is very good for the beef business. So are packers. And especially, so are consumers. Remember this: every dollar that goes into your pocket when you sell your cattle starts when a consumer decides to buy beef.